Flavours that should never have been, and yet were. This controversial Icelandic beer is made with whale meal and will apparently make you "a true Viking". Brewery spokesman Dagbjartur Arilíusson described the taste as something "in between beef and fish." So now you know. Bringing together the flavours of turkey, pumpkin, cranberries and gum! Finally. 3. Chocolate with bacon and potato crisps. It's like there's a party in your mouth and someone threw up on the carpet! 4. Salted caramel green tea. 5. Cheddar and chorizo donuts. 6. Turkey and gravy soda. Ever wondered how carbonated meat juices would taste? Wonder no more. Ingredients: Maltitol syrup, artificial flavouring, colours (E102, E133), scorpion. 9. 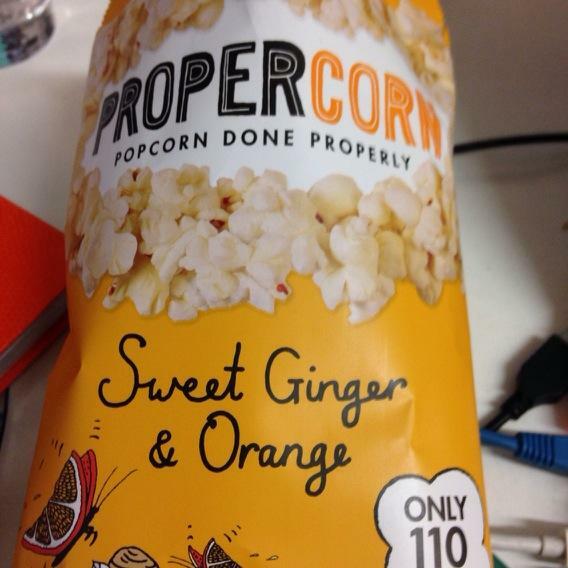 Ginger and orange popcorn. 10. Foie gras bubble gum. Orange juice! And milk! Together in a bowl! Discontinued, alas. 12. Crocodile egg ice cream. This ice cream features crocodile eggs instead of chicken eggs, because crocodile eggs are 80% yolk. 13. Milk chocolate filled with liquid salted licorice. 15. Blue cheese ice cream. The veiny, blue goodness of a mould-ripened cheese, now frozen and in pint tubs ready for spooning into your face. Apparently they taste like vanilla and watermelon-flavoured gum. Which may be what you want in a biscuit, I dunno. 17. Baked potato-flavour Kit Kat. Strangely intriguing. I will not rest until I have tried this. 18. Breast milk ice cream. A dessert called "Baby Gaga" made with human breast milk actually went on sale in London, but was banned in 2011. Combining "spicy hot-wing flavour" with "the subtle acidity of an orange". A delightful combination of 63% dark chocolate, crunchy ramen noodles, onion, garlic and soy sauce. 21. And finally, fried chicken Oreos. Which sadly turned out to be fake.